Slight spoilers fo Miss Peregrine’s Home for Peculiar Children. You have been warned. This book picks up immediately after book one’s conclusion. Jacob and the peculiars have left the island and their time loop that had kept them safe for so long and are on their way to the mainland in three rickety boats. And it’s not smooth sailing. They came out of the loop in 1940, the year it had been created, and there’s a little war going on. World War II. Bomber planes are in the air, submarines are in the water, and the wights are still chasing them. Also – their guardian, or ymbryne, Miss Peregrine, is trapped in the form of a bird and can’t change back. She can’t help them or communicate in any way. So the peculiars head for London, hoping to find another ymbryne who hasn’t been captured yet who can help Miss Peregrine. We get to meet a whole bunch of new peculiars along the way, including gypsies, circus performers, and talking animals. Wights and hollows chase them at every turn and nowhere is safe. Tying everything together is the collection of vintage photographs that provide the illustrations for the story. I still love this idea and it still worked well in this book, just like it did in Miss Peregrine’s. Here’s the thing that impresses me most about these books – the plot twist. Riggs did this to me in the first book – threw a crazy twist into the story that turns the whole thing upside down and . . . I never saw it coming. Not a hint. I like to think that since I read so much, I have gotten at least a little savvy about these sort of things. It’s easy to spot clues when you see similar ones over and over. 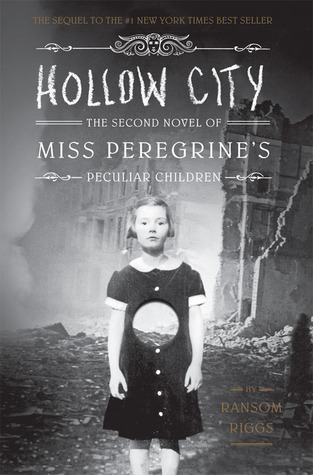 Hollow City’s plot twist threw me for a loop and had me questioning every single character. It was really well done. So overall, these books are great. I love the mythology that Riggs has developed about the peculiars, I love the photography, and I love the story. I can’t wait to see what the third book brings (not that they’ve announced a third book, but WE CAN’T LEAVE IT THERE!). If you haven’t read Miss Peregrine’s, you definitely need to start there, but I recommend that you read both of them. They are excellent.